I will be trying a couple of more new things this school year. One of them can be said to be “new tech” and the other can be called “old school”. Ironically, my new tech idea is named after a very ancient Greek philosopher. I stumbled upon Socrative (socrative.com) during the last Christmas holidays. It is a free online tool to get instant feedback from students in the classroom. 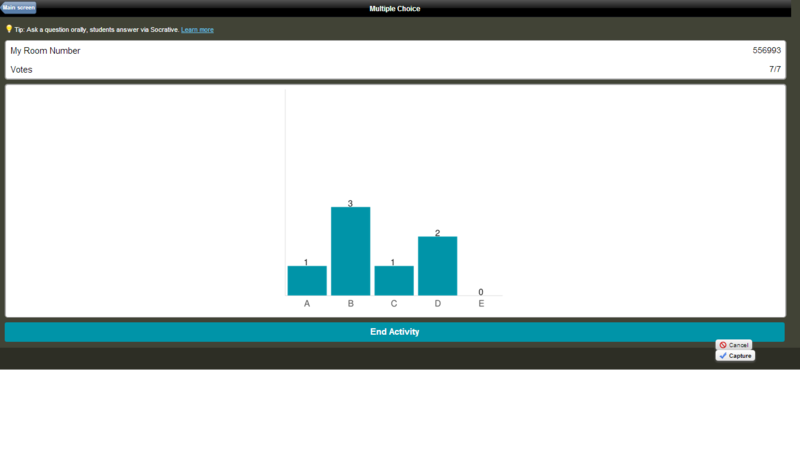 The instructor poses a question (multiple choice, true/false, or short answer) to students, and the students input their answers via Socrative using their laptops, smartphones, or tablets. When I first saw Socrative, it reminded me of the “ask the audience” lifeline in the game show Who Wants To Be a Millionaire. I used Socrative last winter on a limited basis in two of my classes. It was helpful in giving me real time feedback on how well my students were understanding the material being covered in class. For my students, I believe it made their classroom experience more of an active learning process. An extra plus is that Socrative keeps students’ electronic devices busy with class-related activities, instead texting, tweeting, etc. If you have ever used iClickers, Socrative is very similar except with minimal set up time and without the bulky, expensive hardware. Did I already mention that Socrative is FREE! I love old school ideas, especially if they work. I want my students to learn how to “think”, instead of just memorize. Memorization may last a semester, but thinking skills may last a lifetime. The case method of teaching challenges students to think in creative and disciplined ways. The case method was made famous by Harvard Business School and – here in Canada – by the Richard Ivey School of Business. A few months ago, I attended an excellent workshop on case method teaching conducted by Professors James Erskine and Michiel Leenders from Ivey. They impressed upon me the importance of planning and preparation in applying the case method properly. This semester, I will try the case method in a few of my business law classes. Since the focus of my course is on legal analysis of case problems instead of developing business strategy for business cases, I will need to modify the case method somewhat. As well, it is a bit of a challenge to teach using the case method in a course that was not designed with case method in mind. For example, ideally, the assessment structure of a course should reward students for their participation in class discussions of cases. Wish me luck! This entry was posted in Uncategorized and tagged case method, iclickers, ivey school of business, richard ivey school, socrative, technology. Bookmark the permalink.